In 10-inch skillet, melt 1 tablespoon of the butter over medium heat. Add bread crumbs; stir to coat in butter. Cook 2 to 3 minutes, stirring frequently, until toasted. Transfer to small bowl; set aside. Wipe out skillet. Rub chicken with Italian seasoning, pepper flakes and salt. In same skillet, melt remaining 1 tablespoon butter over medium heat. Add chicken breasts; cook 5 to 7 minutes, turning once, until chicken is golden brown on both sides. Using tongs, transfer to plate. Carefully add pasta sauce and water to skillet; stir in pasta, and heat to simmering over medium heat. Top with chicken; cover. 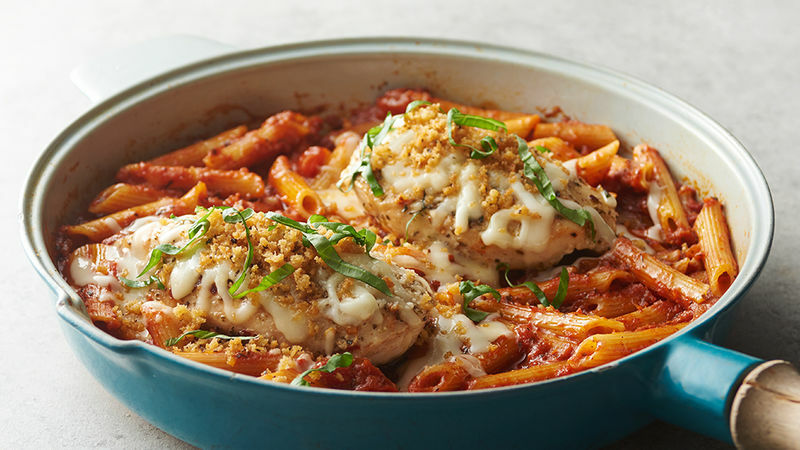 Reduce heat to low; cook 14 to 17 minutes or until pasta is tender and juice of chicken is clear when center of thickest part is cut (at least 165°F). Remove from heat. Top chicken with cheeses. Cover and let stand about 2 minutes or until cheese is melted. Sprinkle with bread crumb mixture. Sprinkle with basil. Move chicken around in skillet on both sides to fully coat in butter. Be careful when adding pasta sauce and water to hot skillet. Pour liquids away from you when adding them to a hot skillet.